In this lesson, we will learn how to convert decimal to fraction. Learn the steps to quickly perform the conversion. Examples are provided. The study tips and math video will explain more. Notice that, we can simplify 12/100 by dividing the numerator and denominator with 4. The math video below will give more explanation on this. Also, we will see some examples it. Let's start by analyzing this fraction, 1/2. Now, we know that this fraction is the same as 1 divided by 2. By dividing, we get 0.5. Now, if we are given 0.5, how do we convert 0.5 back to fraction, 1/2? Here’s how. Logically, to convert 0.5, we need to find a way to remove this decimal point. To do so, since 0.5 has 1 decimal place, we can multiply it with 10. By doing so, we get 5. However, since we multiply 0.5 with 10, we have to divide it by 10 to keep the equation equal. Now, we have, (0.5x10)/10. Simplifying the numerator gives the fraction, 5/10. Note that, we can simplify this fraction, by dividing the numerator and denominator with 5. With this, we have successfully converted 0.5 to a fraction, 1/2. Now, let's take a look at more examples to convert decimal to fraction. Convert 0.19 to a fraction. 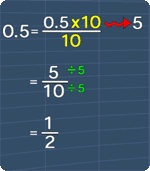 Now, since 0.19 has 2 decimal places, we can remove the decimal point, by multiplying 0.19 with 100. Since we multiplied with 100, we need to divide 19 with 100, so that this term remains equal to 0.19. Now, we have a fraction and this fraction cannot be simplified. Hence, we have converted 0.19 to a fraction, 19/100. Next example convert 0.128 to a fraction. Similar to the previous example, since 0.128 has 3 decimal places, we can remove the decimal point by multiplying 0.128 with 1000. This gives 128. Now, since we multiplied by 1000, we need to divide 128 with 1000 to keep this term equals to 0.128. Now, notice that we can simplify this fraction by dividing the numerator and denominator with 8. By doing so, we get 16/125. This fraction cannot be simplified further. Therefore, 0.128 in the form of fraction is, 16/125. This is all for this lesson. Try out the practice questions to further your understanding. You can start by going through the series of questions on how to convert decimal to fraction or pick your choice of question below.